Ah, Tallsun! Rarely was there one as fine as this, or an afternoon as perfectly pleasant. The sensation of the Sun against your back and the top of your head, and the cool earth pressing against your paws, was probably the most delightful sensation an otter could have. Except, maybe, the cool earth against your back, and the Sun upon your belly! Flopping over to do just that, the otter dad can’t help but smile to watch all three of his pups mimic him. Wait… weren't there supposed to be four? Suddenly back upon his paws, his children suddenly back upon theirs, and nervously or excitedly squeaking, he bobs his head as he counts them. One, two, three. Blinking, rubbing his eyes viciously, and then recounting them, his head is more frantic with its counting bobs. Becoming worried now, the otter dad toddles towards the river bank, the green grass tickling his sides as he walks on his back legs, his pups loping after him on all fours, colliding into a mass of fur and feet when he comes to a sudden stop, and whistles out over the river for pup number four. Oh, if Mrs. Otter came home, and he’d lost one! He was sure he’d lose all his whiskers and his tail then. Whistling out again, he starts to really worry when no answer comes a second time, and no pup number four reappears, either. Looking about for one of the many helpful horse creatures that always seem to be about, the otter waves and gestures to those he sees, hoping that one or two, at least, will come to help him find his lost kid before his wife came back. Vastra’s studies have brought her to the Thistle Meadow, one of her favourite places to visit. It’s easy to spot something new in this place and now that she’s growing, it’s even easier because she can see over all of the grass. Tallsun has come and it’s comfortable visiting the northern parts of Helovia - their temperatures are closer to what she has grown used to in the Throat - and she’s using this time to catch up on the animal families that she discovered last year. She assumes they are all the same, but it’s hard to tell. The young girl is making her way to the river, curious about what stage the tadpoles are at now, when the gesturing of an otter catches her attention. She doesn’t look around - it hasn’t been her instinct to look for an adult in a long time - but rather makes her way over to him right away. “What’s wrong?” She asks the otter in a quiet voice, looking over him and his pups and not seeing any injuries. Perhaps they needed some other form of help? The antlered mare walks along, absentmindedly exploring the meadow. In all honesty, she wasn't here for any particular reason, just boredom and a sense of wanderlust had drawn her from the Basin. It wasn't until a series of squeaks and other odd noises reached her ebony ears that Vertigo even paid attention to where she was going. Halting, the Draft mare blinked rapidly, spotting a small otter gesturing wildly. Another mare seems to have noticed as well the oddness of the small creature. He seemed in a panic and, now curious, Ve trots toward them, ears at attention. The young draft halts nearby, just as the winged mare questions what's going on. It was then that Vertigo noticed the smaller copies of the otter milling about in a pile of fur and cuteness. She smiles warmly, hoping her size and large antlered crown aren't too intimidating to the small creatures. “Is there anything we can do to help?” Her voice is soft, as it usually is, her shyness not allowing her a loud, bellowing voice that would seem to match her figure. Weaver’s life has been a series of adventures. Where smart horses would shy from danger, she has always run headlong into it. Maybe she didn’t value her life enough. But maybe she valued it enough to actually live it. What was life if she cowered in fear, if she let opportunity and adventure pass her by because it might kill her? Once upon a time, she actually could stay dead. And she had died, had actually given her own life to protect the home she lived in. Death’s touch had been kind though. When death comes from others it is a cruel and vicious thing. Why? She isn’t sure, but perhaps because that is what everyone thinks of Death. But no, Death is far from cruel. He is gentle and kind. His touch is pleasant, welcoming. Like welcoming a child home into waiting, open arms, after a long and terrible day. He gave her her life back. He gave her the ability to cross into his territory and come back again. She says hello, not often, but more often than most. One day she will stay, and he will welcome her. For now though, she throws herself headlong into life. Into battles, into adventure, into anything usual that comes her way. Today, it’s a whistling otter that calls to her. And then he’s waving. All right, the whistling was one thing, the actual waving otter is totally another. It’s weird, and so of course, she goes over. What could an otter possibly want? She has absolutely no idea, but whatever, it’s not like she’s got anything better to do today. There are a few others there already. She knows the black and white girl a little too well, and she refrains from rolling her eyes. Instead, she plays nice, offering the girl a nod before settling in to see what the otter needs. The black and white girl (she has a name….Vertigo, maybe?) asks the only question that matters, and so Weaver stays silent, wondering if the waving otter has a clue what they are even saying. The Thistle Meadow was the first place that Aelfwine typically went to when she left the Edge. It was a beautiful place, full of various people traveling from one place to another. It was more social during Tallsun, which she enjoyed. The dappled mare had definitely received her enjoyment of social exposure from her blood line. She wasn’t shy in the slightest, and often did her best to strike up any conversation with anyone she came across. The only one who didn’t receive it well was that one stallion in the Flats, but that was neither here nor there. As she wandered the meadow, gathering little things like herbs and grasses to munch on, she heard a faint whistle. Her heavy horned head lifted as she glanced around the area, spotting a small otter waving. There were already a few other equines heading that way, so Aelfwine figured she might be able to find out what was happening and help if the need occurred. She didn’t recognize any of the faces that had shown up, but she dipped her head in greeting to them with a small smile on her lips as she approached. Settling slightly beside the black and white hybrid, though still allowing space, she let her emerald gaze land on the otter. “Yes, what can we do to help?” She questioned, remembering a similar situation many seasons ago in the Frostbreathe Steppe that felt eerily similar. Only, at that time, it was a small moose calf that had lost his mother. Perhaps this was an opposite opportunity, with a reward at the end. Even if it wasn’t, it was in her nature to help. Even if nothing came from it, she’d at least have a feeling of good karma, helping out a creature that sought it. Aelfwine is seeking a cerndyr with lamplight! for you're more than blood and bone. What a marvelous Summer day, indeed! Yael feels a keen desire to get out of the Edge, to go and spread her wings and sun herself in the middle of a lush meadow. Soak up the warmth…. find some way to store the memory, the <,i>feeling of it for the winter. She’s a shiny little thing, wings spread wide, glinting this way and that with every stray breeze that ruffles her feathers. Silver-white mane fairly glows under the bright sky, creating an overall picture that some might find obnoxiously bright. Yael allows her mind to wander to the Heart Caves to the story she’d read in them not too long ago, to Helovia and its history that is as turbulent as her own people’s, as fraught with disaster as B’kannas. What is it about building a world that requires so many trials before tribulation? What is considered greed, and what is considered a natural hankering for growth and evolution? Yael is seeking a Kitsune with Fire! In the back of her mind, she knows the act itself would be an act of duty, nothing more. And oh, she knows all about duty from her mother’s lectures. Wessex, herself, is the product of such an alliance. She can, however, understand the Father Otter’s distress at misplacing one of his pups. It’s probably wandered off somewhere, maybe fallen asleep in the sun, but that’s just a speculation. So the horned mare is here to help the frantically gesturing fellow, whatever that may mean. Wessex seeks a Hellfire Hellhound! The guardian's flight had taken him to the meadows north of the heart to the very center of the continent; it was the farthest from his new home he'd journeyed thus far, and perhaps the longest flight he'd ever embarked upon! Coal-coloured wings outstretched over the whistling meadow grass, Pippin felt for the first time since his entry to Helovia like he was back home, Over-The-Hill, in the wonderful valleys and dales of his shire. The sweet scent of river water was a releif to his salt-chafed nose, and as he swooped down to land with a gentle thud upon the river bank his sights caught upon a curious bunch gathered upsteam. His drink was quick, lasting only a few large gulps before his wings flared once again, his feet taking him in an unruly trot towards those he could see further downstream. "HEY!" He cooed, the current lifting him up momentarily upon his flared wings as he ran. Soon he approached the back of the group, and by folding his wings and scooting underneath the belly of the bright golden mare and the dappled one too, he moved his way to the front. An otter? That's what they were crowded around? "Hello!" he squeaked "I'm Pippin! A guardian of the Throat, at your service"
Akumi awakened from her mid-day nap to a strange whistling sound. Seemingly coming from nowhere, she passed it off as just her imagination. Tallsun was rather warm today, but thats how she liked it. The Earth was cool beneath her hooves while her black fur soaked in the suns rays. She stretched her legs and began walking forward with no real destination in sight. Suddenly, she heard the tiny whistle again. Flicking her ears back Akumi stopped to listen. This didn’t sound like a happy chirp celebrating a fine day, rather, a call for help. Akumi turned around quickly trotting to the origin of the sound to find an otter with three little ones scrambling around its feet. “What’s wrong otter, may I help you find something?” she asked kindly, observing that he was on his back legs searching for something, or someone. Seeing that her height gave her an advantage over the small otter, she glanced around the area around her to see what might be the problem. Not seeing much, she turned back to make eye contact with the otter in wait for an answer to her offered help. Akumi is seeking a Boggart with Suffocate. Someday somebody will best me. But it won't be today, and it won't be you. A filly, many mares, and Pip - well, that is just the smallest horse he’s ever seen! – quickly arrive from their nearby places in the meadow to the otter’s rescue, which the small creature is quite glad for. His pups, however, have mixed reactions, one so delighted to see real equines up close that she scampers up to them each in turn, her tiny paws reaching to touch their noses. His son, however, is quite afraid, and hides behind his father’s back, peering out at the giant creatures with fearful eyes. The third, perhaps the most intelligent of the litter, simply remains where she is, and watches, particularly interested in the diminutive pegasus stallion. Now, the otter, of course, is but a simple creature, and can’t talk like all those magical folk, despite having mastered whistling; a trick which, apparently, not only lands you the prettiest otter wife in all the river, but also helps you get some help finding your lost pup. Well, getting the helpers to you, at least, the lazy otter thinks, looking about for a means to explain the situation. Pointing to his pups, one at a time, he makes a double pawed point in front of him, where there is no otter pup at all. Shrugging his shoulders up and looking around, he drops his paws, and looks at the horses, hoping they understand. Just in case, he does the entire row of charades again, and again, just for good measure, before setting off to look for his lost pup, himself. The three otter kids left behind, however, have not been told what to do in such a situation, and quickly set out in various directions, themselves. The terrified male pup scampers after his father, likely safe, for the time being, but the friendly female is quick to follow after the largest group of horses, eager to watch Helovian behavior up close, and possibly make friends with one or two along the way. The curious pup simply meanders off on her own search, sure she will find her lost brother, first, and without anyone’s help, for that matter. @Akumi entered the drop late and is disqualified from the final roll. She may continue to participate in the rounds if you’d like! Unfortunately, Vastra wasn’t the only one to heed the call of the otter - others arrived as well. Not as many as some of the strange creatures in Helovia seemed to gather around them, but enough. She didn’t enjoy being this close to so many of them but she wasn’t willing to give up just yet. It was becoming more and more obvious that something was wrong. She tried her best to not look intimidating for the young otter pups that seemed shy, but with all of these other horses around, one friendly face might not do the trick. Her brown eyes are intent upon the parent otter - gesturing towards the pups and then to an empty spot. She thinks she understands - something was missing. Another pup? Or their mother? Either way, it was likely an otter! The father-otter then takes off with one of his pups, presumably to start the search for that which is missing. Vastra was about to turn and head off in her own direction to search when she noticed one of the pups going off on their own. How terrible would it be for another one of them to get lost? So without so much as a glance towards her fellow horses, she hurried after that pup. She could keep an eye on it and look out for the one that was missing… right? Vastra follows the wayward curious pup to keep an eye on her/help find her missing sibling! It isn't long before a gathering has formed. After her large form, a Pegasus joins (who is a member of her herd) as does a fellow antlered maiden. Three more join, including yet another Basin member and the Shire gives both females a nod and a smile in recognition. Granted, she doesn't know them very well, but she is more than thankful for their existence. Especially since they gave her her life. Returning her attention to the otter family, Vertigo is utterly delighted as one of the youngsters comes closer, reaching a tiny, awfully adorable, paw up to her. Lowering her large head, the mare giggles softly, huffing a gently breeze of air towards the pup. The rest of the siblings aren't as gung ho about the gathering and Ve can understand. After all, there are quite a few equines surrounding them, all of which are significantly larger than the furry family. The father begins to gesture again, pointing at the pups in turn. He continues his round of charades, and the large female tilts her head slightly. One missing? Before she can say anything however, the parent is gone on his own to search, apparently, but his children scatter. Vertigo looks after each pup in turn, a feeling of panic setting in. “W..w..wait!” One pup follows his father, which is his safest bet, another heads off in her own direction, the youngest of their equine gathering following suit. The last seems to be content looking with the equines. “Hmm...” An uncomfortable feeling settles in the painted mare's stomach and she huffs loudly. “Someone should go with him just in case...” Her sapphire eyes look after the father and following pup. Snorting she moves forward, following her own advice. Her eyes search to and fro, wondering where exactly an otter pup would hide. “He could be anywhere,” she thinks to herself as she follows the otter parent, stopping every now and again to look in patches of grass, or by driftwood, or really any small, tight place that looks like a good otter pup hiding spot. Others gather, and one of them is quite possibly the smallest horse she’d ever seen before. However, now was not the time to dwell on curiosities. One of the pups approached, stretching it’s little paws out and Aelfwine lowered her pink snipped muzzle to allow the pup to touch her nose. Then, she focused on the Otter as he began to gesture, doing his best to try and get his points across to them that something was wrong and that there was an empty space of where something should be. Again, as he ran through the actions again, Aelfwine found her brows furrowing slightly in confusion. Before she could ask anything, the father otter and a pup start scampering in one direction, one pup remains with the group, and the other runs off in a wayward direction. She watched quietly as a young girl runs off after the wayward pup, then as the other antlered mare follows the father. She looked to the pup that was content with following the group before approaching her slowly and lowering her head with a small smile. “Want a ride?” She questioned quietly, trying to gesture to the small pup that she could ride between her antlers and use the tines as handlebars to direct her as they searched. Even if the otter pup doesn’t accept, she lifted her head and glanced around the area, trying to figure out a separate direction away from the father and the other pup of where they could head to cover more ground. Then, after finding the direction, she picked up her cloven hooves and began to head in that direction. Aelfwine offers the remaining otter pup a ride on her head before heading out in the opposite direction of both the wayward pup and the father duo. Curious as a cat, the stone-coloured Hobbit gave a hearty stomp in greeting to the mister otter. While he had no real clue that he was up to, nor what he was signalling to, Pippigrin caught the aloof gaze of the third pup; a female, who stayed back with her brother and father while her sister ran between each equine gathered and reached up in greeting - all recieved her hello; unicorn, pegasus and all in between. The crown of the goose-coloured boy ducked low to behold the lone pup as she began to waddle off down the river bank. Pipp also took little notice of the dispersing crowd, his eyes remaining affixed on the strange pup who had previously been so enchanted with him. As he clambered over rock and stone, lifting leaves and moving through small game tracks, Pip started to wonder what she was actually doing, and so, of course, he asked. "What are you looking for?" He asked the pup "I can help!" soon turning his crown over his shoulder to find another had followed them down stream. A pegasus, like him, and one he recognised! Perhaps she was from the throat too? "I'm Pip" He spoke proudly towards the girl of russet and sorrel; the colours of their island. A small blush befell his cheeks when he noted the girl was actually quite pretty, and while she did seem of similar age, already she towered over him. He knew that girls did prefer the stronger men who were big and tall - the opposite to him. "I am a guardian of the Throat" he reminded her in the hopes it may impress her, soon turning his gaze back upon the riverside in search of... whatever it was they were searching for. summary; pippin follows the wayward pup who was looking at him, though has no idea what they're looking for and started trying to impress @Vastra . This is just sort of odd. More gather, Wessex included, which seems to be a common trend. Weaver and Wessex spend quite a lot of time together, it seems, though not necessarily turning themselves into BFFs. Or even Fs. They just sort of existed together, and that seemed like enough, as if they didn’t need anymore. Not that Weaver was very good at making friends. She is not, exactly, friendly. She does better stallions, also, than mares any day. After a few more horses arrive, the otter starts trying to gesture, pointing at his three kids and then at an empty space. She assumes there’s a fourth kid, who should be occupying said empty space. Not that she faults him for losing track of his kid. Weaver was always disappearing, so much that her mother had given her a permanent babysitter in the form of a magical raven. Her Raven in Helovia, however, was not her mother’s. He didn’t speak with her mother’s voice (and didn’t even speak), and he didn’t have those brown eyes of hers either. She doesn’t act right away, watching the groups as they disperse, and the otters as well. The father and one pup set off, and the black and white mare from the Basin follows. Two horses, a filly and that tiny stallion, set off after the wayward otter. And another horse offers to give the remaining otter a ride, and Weaver decides pretty quickly she doesn’t feel like hanging out with Cinderella and her animal friends over there. So she follows the father pup and Vertigo, flying instead of walking. The decision is two fold. One, because something bad was likely to happen. Something bad always happened. And she couldn’t bring herself to let Vertigo get eaten by wolves or some nonsense. And two, because she didn’t feel like going with the other groups, which has more to do with it. She flies low, making sure she can see Father Otter and Kid 1. Her amber eyes scan the ground for MIA Kid, figuring from the sky she’s got a better vantage than she does from the ground. Summary: Weaver follows the father and his pup, flying low so she can better look for the missing otter as they go. Wessex blows a warm stream of air out of her nose as the curious pup bounces over and extends its paws. Her (?) fearlessness is adorable, she thinks, especially in the face of such ‘large’ creatures. It is admirable and adorable, and for a hot second the warrior wants the pup to stay – but it scampers off to the next horse in line, and the mottled mare’s attention is drawn to the Father Otter. Not until the second round of charades does the Corporal seem to understand the small mammal’s predicament – which is not good. There are hunters about (she’d recently seen a cheetah made entirely of flames, so… predators are both mortal and magical in these parts), and a curious little pup would most likely be easy pickings. The group begins to divide itself – some joining the trundling Father and kid, others dutifully acting as babysitters for that bold little rascal. 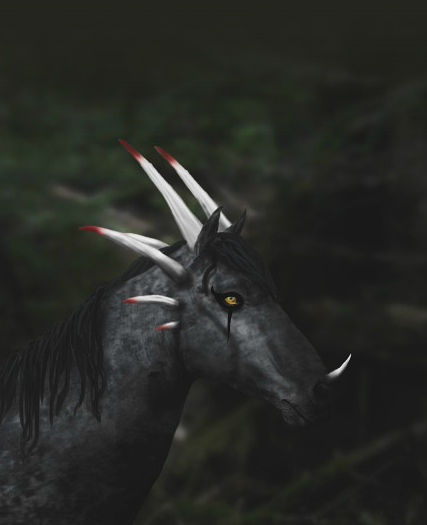 Wessex, however, notices another horned mare offering the final pup a ride (the gray’s antlers are far more suited to perching than Wessex’s sharp, pointy ones), and since there are only two, Wessex assigns herself to that group. Pulling up alongside her chosen team, she offers a nod to the mare and introduces herself. “I’m Wessex – shall we?” Before all three head off in an opposite direction of the other two. Surely someone will find the missing pup. The mother of many, Yael always has a soft spot for children – and it doesn’t seem to matter what species they are. Looking into the wide, curious eyes of the otter pup, Yael whispers a soft “Xello leettle vone,” and smiles, wiggling her nose and bristley whiskers, wanting, perhaps, to make her chuckle (what does an otter chuckle sound like?). She finds the group that has gathered rather interesting – even more so when they split up to help find the missing pup (years of watching her dear son play with Fennec foxes in the Desert made her awfully good at charades). The filly and the miniature horse tromp off after the mischievous pup, while a large draft and another Pegasus head off after the Father and his kid. Two more horned mares take the third. Which leaves Yael with a decision that is easy to make – go with the wayward pup and the group of small(er) horses. She takes a running start and takes to the sky, darting up before coming back down again, and flying over the trio – she has to work to keep herself this low to the ground, and Yael finds herself frequently deviating from a straight line in order to keep herself at a somewhat steady level. Perhaps she the golden Pegasus may be able to provide some direction – she has the advantage of height that others do not. The clever pup looks back to find Vastra following her, her peculiar fire markings making the little creature quite wary, despite the fact that she’s one of the smaller horses about. The other very small horse is not far behind her, his squeaky voice making the otter want to press her paws down on her ears. She’d never hear her brother then, though! So, when a third joins the group, the little otter decides that she’d better put some distance between herself and their voices (and giant, pup squishing feet). Bounding away from the horses, the little pup makes her way down the shore opposite from her father, occasionally darting up the bank to stand on her hind paws, and peer out over the meadow, with one paw raised like an awning upon her brow. The father otter, however, is quite glad for the help, stopping his occasional whistles for his pup, and clapping his paws together once, when he notices the horses coming along with him. His fearful son, however, catches sight of Weaver overhead, and topples into the river with a squeak. Even happier than her father is the friendly little otter, who feels fit to burst with excitement by the time everyone starts branching out into groups. With little otter chits of laughter that follow her even as she makes her way to Aelfwine, the sensation of Yael’s whiskers lingers for a while. Rubbing at them before she elatedly clambers up the doe’s face and clings fast to one of her multi-tined horns, the pup lets out a pip of delight when the mare lifts her crown, otter in tow. Glancing back at Wessex with a toothy smile, she is quite amazed when Yael takes flight, unlike her skittish brother (just now making his way out of the river he’d fallen into), following her upwards and serpentine path with shining eyes. Some time passes without sight of the missing pup, however, and soon, the father begins to think about doubling back, his shoulders sagging ever so slightly at the mere notion. Not only was he going to lose his handsome whiskers, but he was out a rather fine son, too! Feeling a tear well up in his eye at the sudden onslaught of despair, the father otter pauses to wipe it from his eye with the back of his black paw. It’s just then, however, that a shrill otter squeal of fear and delight resounds down the river, not very far from where Pip, Vastra, Yael, and the clever pup have wandered down stream. Trundling down a nearby hillock, what appears to be a round stone with an otter pup wrapped around it careens towards the riverbank with swift speed. Plopping into the water with a splash, both pup and egg bob up to the surface, the little otter doing his best to hold fast to his prize, while squeaking for help from the nearest group. The dappled doe was elated when the otter pup climbed up her face and situated herself along her antlers. She set off with a few others in tow, one named Wessex that introduced herself. They were similar in a way, both dark and monochromatic, yet they seemed opposites. Despite their differences in appearances and perhaps other things, Aelfwine smiled to the mare with a soft nod, careful to not disturb the pup that sat upon her brow. “I’m Aelfwine! And yes, we shall.” She answered before they headed off in their own direction. Time seemed to drag on with no avail, before a shrill yet distant otter squeal came from down the river. Glancing back at Wessex, Aelfwine immediately changed her directory toward the sound, surveying where the call may have come from. 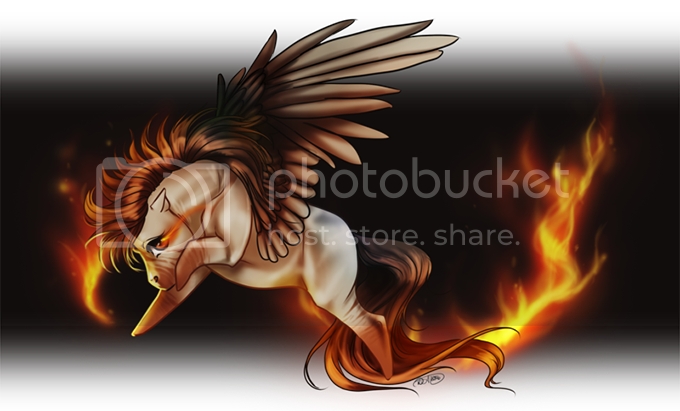 As she approached, she noticed that the golden mare, fiery filly, and tiny pony were the closest, yet Aelfwine aimed to do what she could to help. She wasn’t sure how well the filly or the pony would be able to handle trying to save a pup falling into the water. Immediately jumping into action, Aelfwine murmured to the pup to hold still, using her cloven hooves to her advantage and gripping the side of the riverbank, moving further downstream than the pup was to try and intercept him. She stepped into the fast moving river, just enough to try and keep her grip, stretching her neck out with the otter pup on her antlers, hoping that maybe the other pup would be able to reach out further and grab her brother. Though, the doe didn’t take into account the possibility of the other otter pup falling into the water as well. Hopefully the others would come to help, knowing that the dappled doe couldn’t do it on her own. After hearing the call, Aelfwine turned her attention to the squeal, moving further down river than the pup and stepping into the water, stretching her head out to try and have the pup sitting on her antlers try and grab her brother. She almost laughs aloud as the little pup falls into the river. Almost. She’s kind of terrible for thinking it, probably. All the other bleeding hearts around here would feel bad for the thing, would probably swoop down to make sure it’s okay. Maybe even help it out of the water. Weaver just moves in lazy circles above, keeping an eye on father and pup until the pup gets out of the water A-Okay. At least she doesn’t abandon it, though she doesn’t mainly because losing a second pup when they are already supposed to be finding a lost pup seems counterproductive. She keeps flying, eyes alert, though she sees nothing and is quickly bored of this. Nothing bad even happens, which is more boring. She’s expecting something to blow up or someone to be attacked or something. Nothing in life comes easy. And this, though boring, is easy. It seems too good to be true. Then the shrill squeak of an otter pup catches her attention. She turns course, moving as quickly as she can in flight until she finds the pup in the water clutching what suspiciously looks like an egg. Too easy. Yes, the pup is in real danger, but getting him out can’t be that hard. There’s got to be a river monster waiting. She looks around for something she can use, eyes settling on a long branch that looked like it might serve to catch the pup. It’s not so big that she can’t grab it with her mouth, but the end splitters into many smaller branches and twigs that might serve as a sort of netting. She lands, grabbing the branch, and then takes off into the sky again, moving downriver right past the pup and Aelfwine, who’s reaching with her horns. Weaver sticks the net-like end of the branch into the water in front of the pup, hoping it will catch him if he misses Aelfwine’s horns. And then hopefully he could climb either onto the branch itself, or she could push him back up river until someone could get him out. And this all better happen quickly, because she can’t really fly dead in place. She does her best, moving up and back just slightly, trying to keep in line with whichever way the pup goes. Summary: Weaver grabs a branch that has a bunch of smaller branches/twigs on one end and sticks it in the river right past Aelfwine to use as a net to help catch the pup.